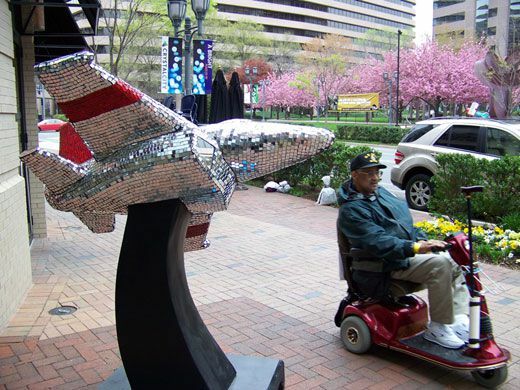 Aviation meets urban sculpture in Arlington, Virginia. Visit the urban neighborhood of Crystal City in Arlington, Virginia, just across the Potomac River from Washington, D.C., and you’ll soon get acquainted with your noisy neighbor to the east—Reagan National Airport, one of the nation’s busiest. 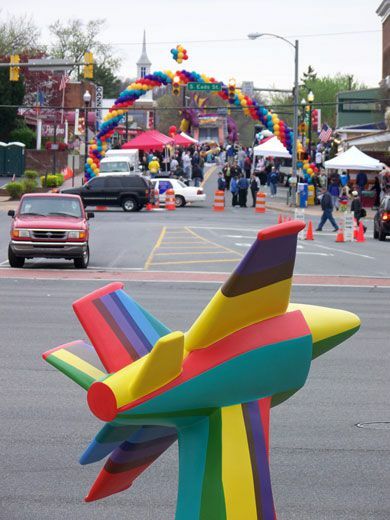 Rather than complain about the airplanes, the people of Crystal City decided to build their own. 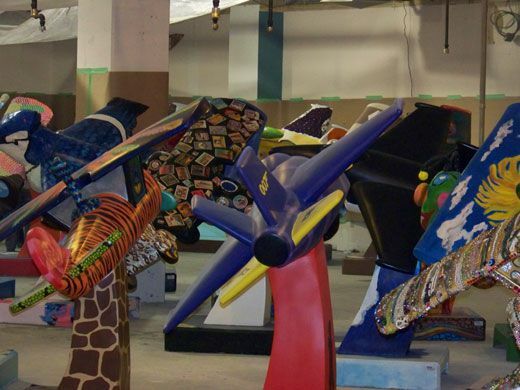 On April 13, in a block party raucous enough to compete with the whining jets, the city unveiled 50 airplane sculptures that will be displayed for six months on sidewalks and other public spaces. Each airplane stands five feet tall, with a wingspan of five feet, and comes in one of two flavors: vintage airplane or fighter. 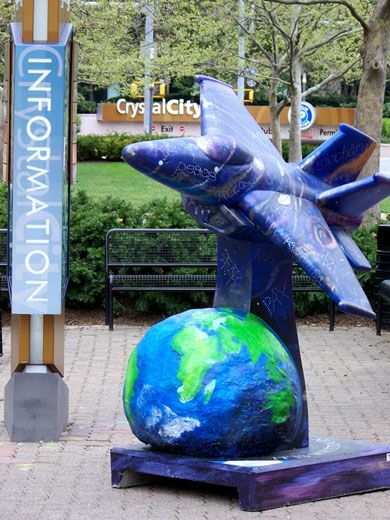 Angela Fox, president of the Crystal City Business Improvement District, says, “Our goal is to inject art and whimsy into the soul of Crystal City.” (Residents will be pleased to find either in a suburb known for drab concrete and office buildings.) Fox wouldn’t be doing her job without also mentioning the neighborhood’s aerospace businesses, some of which sponsored the display, known as “Crystal Flight.” Within a few blocks of each other are the headquarters or government-relations staff of dozens of firms including Boeing, General Dynamics, and Lockheed Martin. 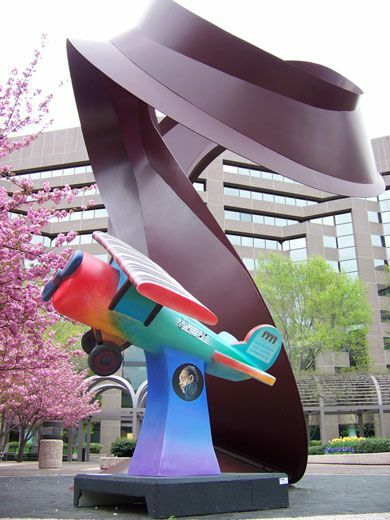 Each of the 50 sculptures (Arlington County Chamber of Commerce contributed the Wright Flyer to honor the airplane that flew at nearby Ft. Myer in 1908. 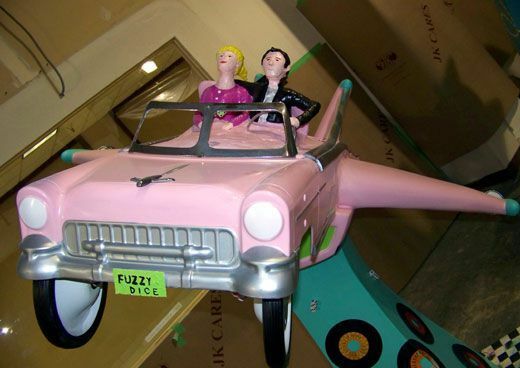 Fuzzy Dice, a classic 1950s pink Chevy convertible by artist Wendi Ballas, was sponsored by the commercial real estate firm Cassidy Pinkard. 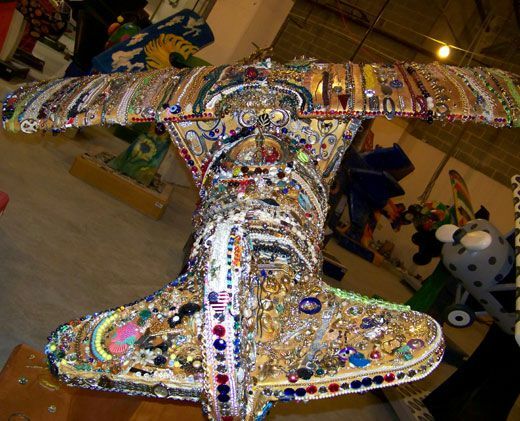 And artist Diana Gamerman created her encrusted Jewelry Plane for Vornado, another real estate firm. Fox’s Crystal City Business Improvement District sponsored several of the pieces itself, including From Crystal City with Love, a fighter that Agent 007 might have flown into National. Beginning on May 5, the sculpture will guard the entrance to an open-air venue in the heart of the business district where all 21 James Bond films will be shown, one a week, through the end of September, in anticipation of the fall release of the 22nd Bond film, Quantum of Solace. 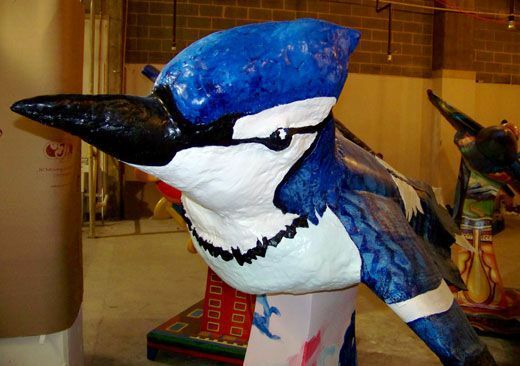 Crystal Flight is not the first public art installation to be measured in miles. Zurich, Switzerland, introduced its Chicago was the first of dozens of towns to follow with its own version a year later. Other cities have branched out to dog sculptures (New York), pigs (Cincinnati and Seattle), fish (Baltimore), and turtles (Tampa). The Washington, D.C. area has previously seen Party Animals, in 2002, which was a run of Democratic-party donkeys and Republican elephants, and PandaMania in 2004, in honor of the National Zoo’s most celebrated residents. Sadly, within the first month of that exhibit, at least seven pandas were vandalized, and some were later stolen. Crystal Flight’s sponsors can only hope the same fate doesn’t befall the airplanes, which are parked for maximum visibility in high-pedestrian traffic areas or on grassy mounds in the neighborhood’s urban water park.